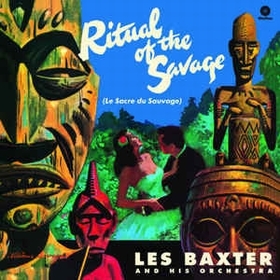 Ritual of the Savage is an album by Les Baxter, released in 1951 often cited as one of the most important Exotica albums. The album featured lush orchestral arrangements along with tribal rhythms and offered such classics as "Quiet Village", "Jungle River Boat", "Love Dance", and "Stone God." Baxter described the album as a "tone poem of the sound and the struggle of the jungle." The album's liner notes requested the listener to imagine themselves transported to a tropical land. "Do the mysteries of native rituals intrigue you? Does the haunting beat of savage drums fascinate you? Are you captivated by the forbidden ceremonies of primitive peoples in far-off Africa or deep in the interior of the Belgian Congo? 2018 Europe pressing, includes the original liner notes on the backside of the sleave and an additional song, 180 gram vinyl!